Guess what? This is NOT a standard Grisham novel. It took me by surprise, and I’m still not sure how I feel about it. There will be spoilers here, so if you think you’ll read the book – and I’m about three-quarters of the way to recommending it – just go get the book and skip my review. 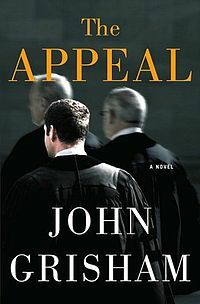 The Appeal is the most political of the John Grisham books I’ve read. It deals with a case by a small-town husband-and-wife legal team, suing a chemical corporation for knowingly dumping toxic waste and leading to cancer and death among the townsfolk. (Sound familiar? Isn’t this basically the plot of Erin Brokovich?) They win the case, but of course the corporation appeals. And the owner of the corporation finds a sneaky-sneaky way of putting a new justice on the state Supreme Court. The majority of the book is about how he accomplishes this, so I felt like Grisham’s intent in writing The Appeal was to convince me that state Supreme Court justices shouldn’t be elected. The bad guy is successful, and is so sneaky-sneaky that the new justice is an honest, respectable man who doesn’t realize he’s part of a scheme. The new justice is not litigation-friendly and votes against big settlements. Then, twist! His son is injured in a Little League game by a bat that is unsafely manufactured (knowingly), and the ER doctor misreads his chart and sends the boy home – where conditions worsen and he is left with severe brain damage. And might die. If only that doctor hadn’t been incompetent! If only the bat manufacturer had recalled the dangerous bats! While the justice is in the hospital with his son, it comes time to vote on the Erin Brokovich case. Extra twist, he votes against it still, but he changes his vote on a different-but-similar appeal, showing that he does care about the little guy. Seriously though, it was just an attempt to sell you on appointing justices rather than electing them.